This page is for the legacy version of Chargebee Orders. You would certainly be using the latest version if you enabled Chargebee Orders on or after 28th September 2018. If you use the legacy version, please read this note before upgrading. Order tracking is the process of closely following an order received by the business, up to its stage of fulfillment. Order tracking provides you with a clear picture of stock movement, which in turn provides up-to-date visibility of incoming and outgoing stock: quantity ordered, quantity shipped, quantity in transit, and so on. You also get to know when and how much to reorder, which ultimately helps you minimize back-orders. You run an e-library. You deliver three books per month to your subscribers, and charge them for the subscription on a quarterly basis. So you need to track pending deliveries every month. That is, every invoice you raise needs to have three orders linked to it. How would you go about this? Enable the feature by checking the option Enable Order Management under Settings > Configure Chargebee > Billing Rules. 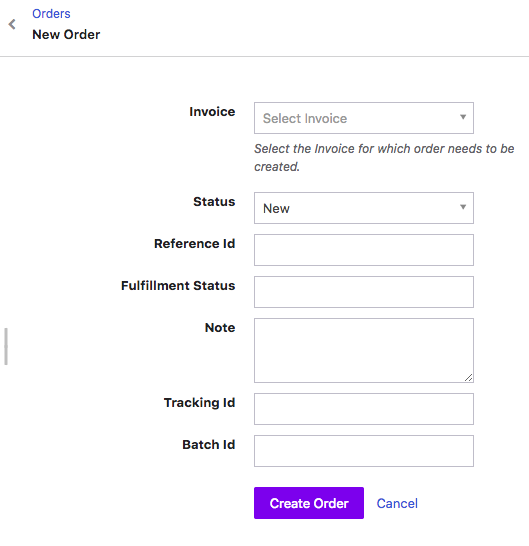 The option to create orders will now be available in the Invoices page. Click the Actions icon of the required invoice and then click Create a New Order. You can also create an order using the Create a New Order option in Orders. New: The order you are creating has just been received. Processing: The order has progressed to the next stage, say, if the goods are on the way to your customer. Complete: The ordered items have been successfully delivered. Cancelled: The customer has for some reason withdrawn the order post its acceptance or fulfillment by your business. Void: Any undertaking to fulfill the order has been withdrawn by the business, or has been asked to be withdrawn by the customer, before fulfillment. You can create and link an order to invoices of the statuses Paid, Payment due, and Not Paid. You can create, update, and retrieve orders using the Orders API. If you wish to create/update multiple orders at once, you can use bulk operations by navigating to Settings > Import & Export Data > Choose a bulk operation > Select Orders under Choose an operation.